Celebrated authors, the Pop This! Podcast, LitCafés, storytelling and kids’ programming set for 7th Annual LitFest New West. New Westminster, BC– Showcasing BC’s vibrant talent, the 7th annual LitFest New West returns with an exciting mix of featured author events, literary cafés, children’s programming, writing workshops, a community exhibition, and a special literary marketplace running March 31 – April 2, 2017 throughout New Westminster. LitFest New West brings together “Readers, Writers, Community” for three days of celebrating New Westminster’s literary arts community. 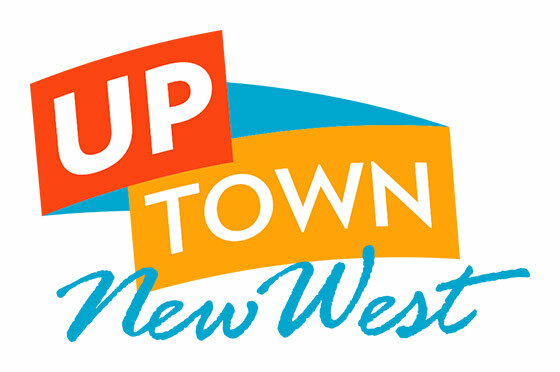 Events will take place at venues throughout the city with a special kick off at New Westminster Public Library at 7:00 – 9:30 pm on Friday March 31, 2017. Broadcaster Lisa Christiansen and author Andrea Warner launch the three-day event with a special live recording of their popular Pop This! Podcast (two women talking about everything pop culture). They’ll be joined by New Westminster resident, fashion columnist, and memoirist JJ Lee, along with a cash bar to help words go down as smooth as ice. Aislinn Hunter – Winner of the 2015 Ethel Wilson Fiction Prize, New York Times Editor’s Choice winner for her book, The World Before Us. Nasreen Pejvack – Author of Amity, Finalist for the 2016 Ethel Wilson Fiction Prize and activist who moved to Canada from Iran in the mid-1980s. Catherine Owen – New West resident, author of 13 collections of poetry and prose and Dear Ghost, her 2017 collection of poetry. Carleigh Baker – Cree-Metis/Icelandic writer whose first memoir, Bad Endings, (Anvil Press, 2017), is available now. She writes book reviews for the Globe Mail and has been published in a variety of local literary journals. 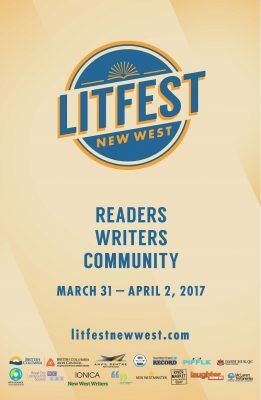 LitFest New West is proud to be expanding in 2017 with the addition of children’s programming. Workshops will be lead by children’s author/illustrator Lee Edward Fondi and New Westminster police officer and children’s author Grayson Smith. Both authors will be at River Market on Saturday, April 1 alongside the annual LitFest New West Literary Marketplace presented by New West Craft. The festival will be rounded out with a variety of workshops and events happening throughout the community featuring readings by local authors and poets. New West Writers Critique hosting a Critique Session at The Gallery at Queen’s Park on Sunday April 2nd. Royal City Literary Arts Society bring their Wordplay and In Their Words series that might just ignite your own muse. Lastly, enjoy pairings of visual and literary arts at the Anvil Centre’s Community Arts Space featuring 18 artists from April 1st to June 2nd. Exhibition opening on April 1st from 3:00pm – 5:00pm at the Anvil Centre includes readings by authors and cash bar.